WAIST HIGH: Brian Eno Documentary To Debut. Brian Eno Documentary To Debut. From MOJO: Brian Eno will be the subject of a new BBC FOUR documentary set to debut at the end of the month. The legendary producer and electronic music guru has given the Arena team unprecedented access to his life in the studio. Topics of discussion are expected to include "science, art, systems analysis, producing and cybernetics." We would expect nothing less. In 2008, Eno teamed up with Talking Heads pal David Byrne to release Everything That Happens Will Happen Today. He has recently been working on U2's forthcoming Songs Of Ascent. 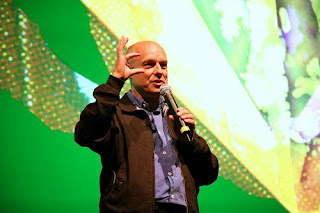 Arena: Brian Eno - Another Green World will be shown on BBC FOUR at 9 p.m. on Friday, Jan. 22.